tarting with the New York City Crystal Palace Exhibition in 1853, the United States has hosted dozens of fairs, expositions and celebrations. Various medals were issued at all of these events as well as commemorative coins for some. The first big exposition was the Centennial Exposition in 1876, held in Philadelphia on the 100th anniversary of American independence. Various medals in bronze and silver were issued as well as store cards or trade tokens. The next event of this size was the World's Industrial and Cotton Centennial Exposition held in New Orleans, 1884-85. Several medals were issued for this event. The first truly international event was the 1892-93 World's Columbian Exposition held in Chicago honoring the discovery of the New World by Christopher Columbus in 1492. This was the first exposition where the mint issued coins marking the event. The two commemorative half-dollars dated 1892 and 1893 featured Columbus and his ship and a pair of globes. The other coin, a quarter, featured Queen Isabella, who helped finance Columbus' voyages. In addition, this fair poured out numerous medals in various metals, a series of elongated coins (the first fair to issue such souvenirs), as well as many other kinds of souvenirs in materials such as glass and wood. More than 100 kinds of medals, tokens and related souvenirs were issued during the exposition. The California Midwinter Exposition was held in San Francisco in 1894 and featured various medals and elongated cents (as well as other denominations). The Cotton States and International Exposition of 1895 was held in Atlanta. A few medals are known to have been issued for this event. In 1898, the Trans-Mississippi and International Exposition was held in Omaha. Medals in bronze and silver are known for this event along with store cards, elongated cents, and souvenir pocket mirrors with a cent encased. 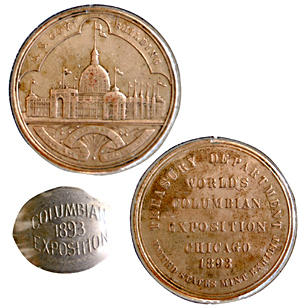 The 1901 Pan-American Exposition was held in Buffalo, N.Y. A variety of medallic souvenirs came out from this event, including medals in bronze and silver, trade tokens, elongated cents, encased cents and pocket mirrors, among other types of souvenirs. 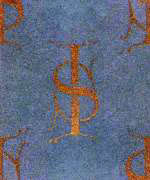 The encased "LUCKY PENNY" made its debut at this event. This was also the site where President McKinley was assassinated. The next expo was the South Carolina Inter State and West Indian Exposition, held in 1901-02 in Charleston, S.C. Souvenirs included medals, store cards, elongated cents, encased cents and pocket mirrors. ©2007, THE SIGNAL · ALL RIGHTS RESERVED.